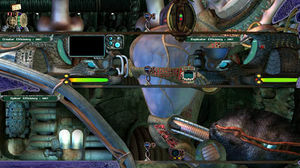 A screenshot of upper Engineering. The Engineering level is a metaroom that comes with Creatures 3. It contains such machines as the Replicator, the Agent injector, and the Splicer, as well as a useful Cheese Machine for any wandering creatures. It is attached to the Bridge by a corridor that contains doors to other areas of the ship. As well as many useful shipwide maintenance tools, the engineering area comes with a small airlock and a variety of pretty yet fundamentally useless background items, such as the lung (visible in the screenshot as a clam-shell like object in the bottom right). This page was last modified on 25 June 2018, at 20:01.